In the following post I am going to challenge one of your deepest beliefs about yourself, one that’s continually holding you back. DO NOT READ if you need to maintain your belief that lack of money is keeping you from your deepest goals… If you prefer to continue creating the same outcomes out of comfort and convenience stop reading now! “I CAN’T AFFORD THAT!” This powerful illusion keeps many from pursuing their dreams, particularly the dream of having the leanest, strongest, most supple body possible. That belief however is in fact an illusion, one I know firsthand, and more importantly for you, one I can prove to you as well in 10 minutes if you so choose to face this fear right now. SO yes, I do charge a good deal initially, and that’s the way our system currently works, better is better and more desirable, and better means a higher cost. The illusion I referenced earlier however is in the impact to the student. Making the deposit and payment may not be comfortable, many have had to extend themselves beyond their comfort zone to do so, just as I have had to do to learn all my skills from the best teaching possible. After that though the cost is comparable if not cheaper than most personal trainers, while delivering far greater results, guaranteed. After the transformation? SAVINGS! Everyday, year round, for the rest of your life. More importantly, your renewed health provides you with a far greater resource than money; high quality time. THAT’S the illusion I spoke about. When we initially set off on the path of regaining our inherent abilities that our modern environment has robbed us of; our ability to move effortlessly, to have great physical and mental strength, to have our best physiques, to be vigorous in every facet of our lives, there are indeed new costs. In reality, living vigorously, strong AND healthy, is far cheaper than your current lifestyle if you’re struggling with creating your optimal body. IT ALL COMES DOWN TO PRIORITIES. The priorities and needs of our greatest self, versus the priorities we currently are putting into action each and every day that are creating your results. You see, you’re actually already spending A LOT to create your current body each and every day, and those expenses are preventing you from realizing your leanest, strongest body, one that would allow you to accomplish far more everyday. You may be expecting me to begin detailing higher costs, mortgages, car payments, etc. and suggesting you downsize your life. Nope. We are going for low hanging fruit, expenses that are overlooked but in reality draining a huge amount of your income while worsening your health. Coffee costs between $0.25 and $0.50 per cup if embellishing with high quality add-ins at home, compared to your average Starbucks that is 7-10x more expensive with lesser quality add-ins, such as cheap sweeteners and creamers. Alcohol is priced 300% to over 1,000% higher in restaurants and bars! For many, perhaps even you, entertainment costs easily pay for a transformation. I do far better than most as far as these obvious overspending habits, yet I too still found about 1/6 of our income being spent frivolously. Given the many interviews I have done it has become apparent that this is the norm for most, so if you’re serious about now creating your best body, one that will literally not only give you MORE life, but a higher quality experience each and EVERY DAY then take a few minutes and enter your costs into the excel program within the link I’m providing below. Now I’m in no way saying one must live a Spartan lifestyle, pinching pennies at every turn. The point of this exercise is to clearly see what our real priorities are, where we spend our money, money that we have literally traded our most valuable resource to acquire, our time, our life. We may in fact be spending in ways that are ineffective at coping with our stressors, entrenching us deeper in jobs, careers, lifestyle that are draining us. It’s a vicious cycle to say the least, one that everyone I’ve known has gone through at some point. Starting now, let’s right the ship, let’s invest our money and time in ourselves, our families, to become far stronger and enjoy each minute of each day for more than we have in the past. I’m going to do whatever it takes to coach 100 students this year to achieve their greatest transformation, are you going to be one or will you be in the same place this time next year? 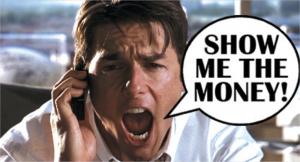 Click on good ‘ol Jerry Maguire below and be honest with yourself about what it is you buy and how often, at the very least you decide you’re satisfied where you are at and continue on as is. On the other hand, you may see like I did that the biggest things I want are well within my reach if I make some adjustments to my lifestyle. P.S. If you’re ready NOW to become your strongest-self then it’s time we had a chat.